This is a set of two Pro-Line 3.8" Badlands Tires, pre-mounted on black Desperado 17mm 1/2" Offset Monster Truck Wheels. Are you ready to tackle any terrain? If so, then the Badlands tires are the answer for you. 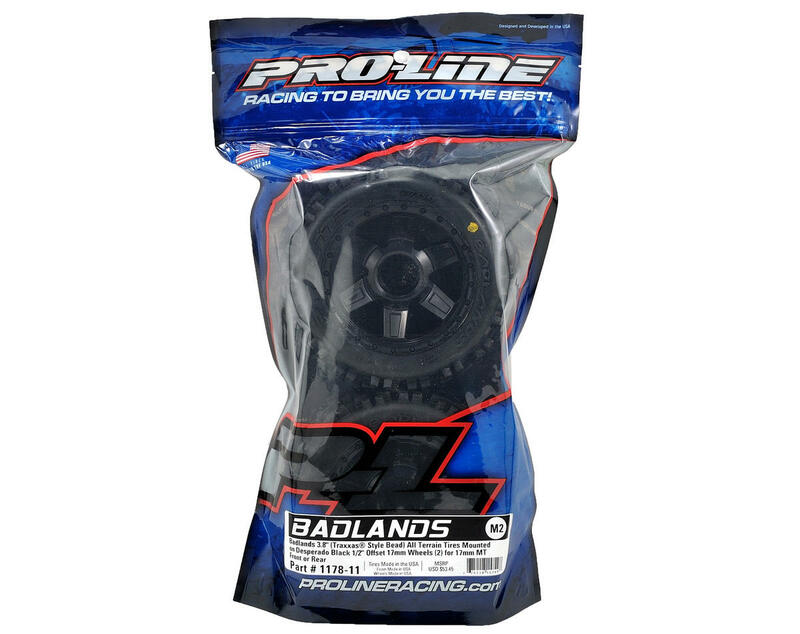 The Badlands tires offer motocross style tread that is for adrenaline pumping Monster Truck and Truggy bashing. The Badlands tread is made strictly for the motocrosser in you. Its oversized grass and dirt shredding lugs offer you the ultimate in performance under all-terrain type conditions. Now that the tire is pre-mounted on Desperado wheels, you can hit the dirt even faster. The tire lugs are designed to ensure longevity while spitting up the surface below. Made from soft yet durable M2 compound, the Badlands tire is poised for battle and ready to take your Monster Truck or Truggy to the next level. The Desperado wheels feature a molded in bead-loc ring for an awesome scale look. Pro-Line has combined high strength nylon with a super smooth finish to give you the ultimate in wheel selection and style. This 17mm hex wheel and tire combo is sure to make your truck stand out from the rest, so get some today! This tire/wheel combo changed he handling characteristics of my Savage 4.6. It was like a night and day difference in the handling department. This is a great tire/wheel combo and the desperados also look really nice. These tires are able to handle generally any terrain. I'd say an 8/10 on-road, 7/10 on grass, 8/10 on loose gravel and dirt, however maybe a 3/10 on sand dunes. I think paddles are the best tires for loose sand and snow. But I'm greatly satisfied with the overall feel for the drivability of the truck. I freaking love this combo! Currently running them on my 8ight-TE 2.0 with MMM combo and 6S lipo. Incredible amounts of traction on loose dirt, wet/muddy dirt, hard packed dirt, paved roads, pretty much everything. The 1/2" offset increases stability both on the ground and in the air. Highly recommended. 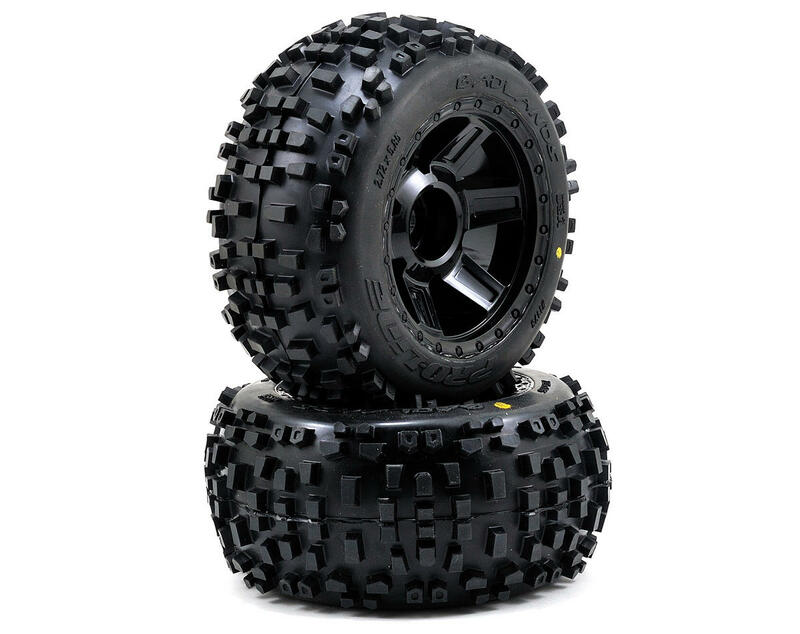 Will replace my LST2 tires with these soon. Brilliant wheel/tire combo for a Brushless E-Revo V1. Not too heavy, so your driveshafts survive.